The best dvd media ! Natureinks recommend Primeon DVD media range for it's reliability and compatibility. Less burn error compare to other brands. One of our best seller ! Natureinks recommend Traxdata DVD media range for it's reliability and compatibility. Less burn error compare to other brands. " One of the most popular OEM media disc in the market known to many customer for years ". Natureinks recommend Xlayer DVD media range for it's reliability and compatibility. Less burn error compare to other brands. One of our best seller ! Less means more. Huge reliable discs in small package. Natureinks recommend Kodak DVD media range for it's reliability and compatibility. Less burn error compare to other brands. 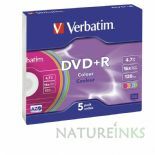 Natureinks recommend Fortis DVD media range for it's reliability and compatibility. Less burn error compare to other brands. " Made in Taiwan ! Natureinks recommend MediaRange DVD media range for it's reliability and compatibility.